Series 7000B Spirahelic® Direct Drive Pressure Gages with turret mount housings feature a triple coil spiral/helical wound Bourdon tube to provide dependable service. Bourdon tube design eliminates gears, springs, linkages and complex movements which can wear and cause inaccuracy or early failure. Series 7000B gages come standard with a dual-size 1/2" male NPT and 1/4" female NPT process connection. Wetted Materials: Grade A Accuracy: Beryllium Copper Bourdon tube, nickel plated brass connection block. Grade 2A Accuracy: Inconel® X-750 alloy Bourdon tube, type 316L SS connection block. Accuracy: Grade A (2%-1%-2%); Grade 2A (0.5% F.S.). Pressure Limit: 150% of full scale. 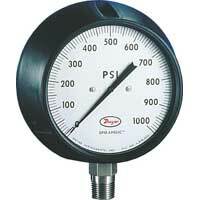 Gage will maintain its specifications for overpressures up to 150% maximum range. Normal operation should be between 25% and 75% of full scale. Size: 4-1/2" (114.3 mm) dial face - Design conforms to ASME B40.1. Process Connections: Dual size 1/2" male NPT x 1/4" female NPT, bottom connections. A-240-C - Cooling tower, perforated, 1/2" male/female NPT. A-250-C - Cooling tower, spiral, 1/2" male/female NPT. A-256 - Pressure snubber, brass, 1/2" male/female NPT. A-262 - Pressure snubber, 316 SS, 1/2" male/female NPT.